I was leafing through a gorgeous magazine, dedicated to “promoting the wonders of chocolate around the world” – an exquisitely photographed publication named Cocoaroma, and came across an article featuring a serene and gentle looking man named Nakanishi Hirofumi who makes chocolate in an old tea house in Kyoto, Japan. 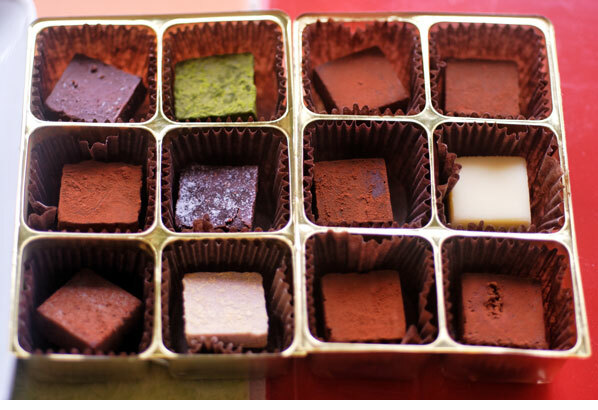 He is described as rising at 4am, to begin his day, seated in front of a low table, on a tatami floor, cutting his chocolate by hand, into the small squares which are artistically boxed, and sold in his shop. The photographs on the following pages show small, earthy coloured squares which remind me of terra cotta tiles – not polished at all, each one dusted with cocoa or green tea powder. He makes three flavours: sweet (milk chocolate with Austrian herb liqueur), bitter (organic dark chocolate with sake from Okinawa) and matcha (with green tea). I am intrigued. 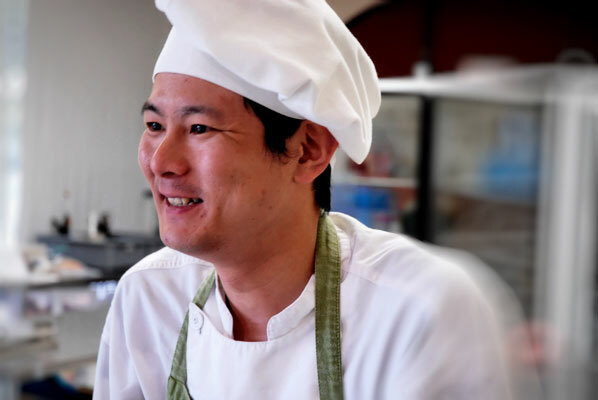 He describes how eating chocolate at Kyoto Nama Chocolate is a full sensory, sometimes a full-day experience, savouring flavours, colours and textures, and taking in the beautiful gardens surrounding his tearoom. He mentions two customers who lay down on the pillows in his tatami room, after eating chocolate, and had an afternoon nap. Perfectly acceptable and no-one would dream of interrupting them. I have to try some of this. Unfortunately, I cannot afford a trip to Japan, at the moment, although this is another reason to want to visit that lovely country. So I sigh, and sip a cup of green tea instead, leafing through the pages and salivating. Fast forward to last week, and I am researching savoury chocolate. An interesting link comes up on my search: a shop where a person can sample tomato, soy, and red bean paste chocolates, among the more conventional milk and dark. La Chocolaterie, I discover, is in Richmond, a suburb of Vancouver, and only a half hour’s drive from me. 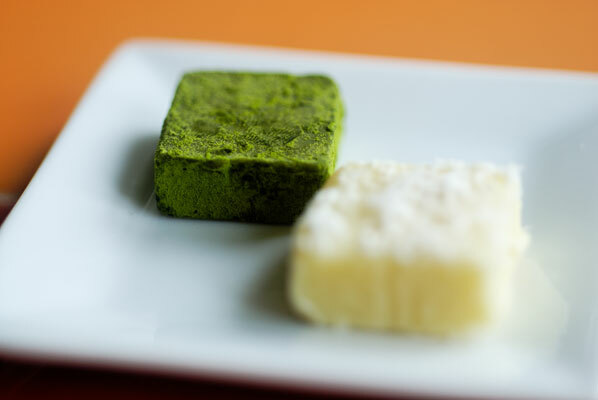 The pictures on their website website remind me very much of the ones I saw in Cocoaroma, with more flavours and colours, some of which take me far beyond my zone of familiarity, such as Yuzu (a Japanese citron) and black sesame. La Chocolaterie opened its doors in December 2010, which may explain why I had not heard of them. It is owned and operated by the husband and wife team of Takanori Chiwata and Kayoko Hamamoto, who worked for ten years, for Meiji Chocolate, in Japan, where they researched cocoa bean cultivation and developed new products, before coming to Canada in September of last year. I feel lucky they did. It takes little convincing for my family to agree to a “chocolate road trip”, so last weekend, we headed out in our little red car to Richmond, and to the Japanese marketplace, Izumi-Ya. Just to the inside of the market, on the left, next to the butcher’s, there it is – La Chocolaterie. 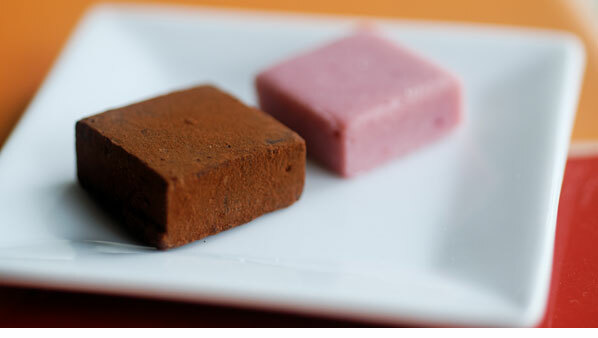 I have now learned that the little cubes Taka and Kayo craft are called Nama Choco, which translates to fresh or ‘raw’ chocolate (I prefer fresh – much more appetizing). Essentially a ganache – a mixture of cream and chocolate – Nama Choco has been very popular in Japan for some years, now. 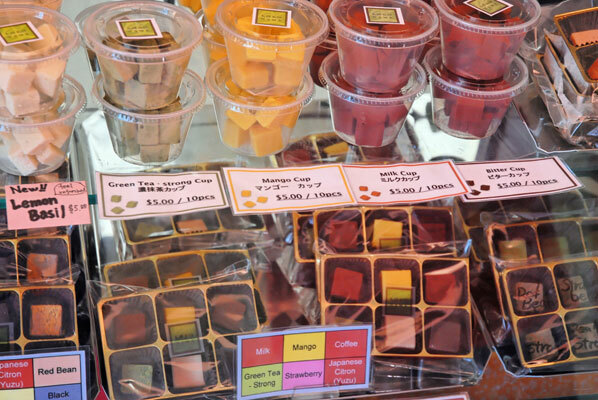 Cases of wonderfully coloured nama choco are displayed, and Taka is behind the counter. Friendly and eager to offer a sample of any of the chocolate, I try the bright yellow mango. Delicious, not too sweet. Creamy and silky, quite delicate and soft. But now my eye has wandered to a sign displaying the “Explosion” chocolate of the week. This week, it is a Mango Explosion – mango puree surrounded by green tea infused chocolate ganache, rolled in green tea powder. Taka suggests that I eat it right there, as it is best served chilled. Of course, I am happy to comply. I pop the whole thing into my mouth, and press the shell to the roof of my mouth with my tongue. Oh yeah. It explodes in a swirl of tart mango puree shattering the astringency of the outer coating of green tea, and finished by the sweetness of white chocolate. It is gone far too quickly, tasting as much like a fresh dessert as a bon bon. Tart and luxurious. I cannot possibly eat anything else after that taste sensation (I want to hang on to it as long as possible), and after a quick consultation with the family, we decide on a take home sampler called the All Star: 18 squares, made up of most of the flavours on offer, except tomato and green tea-regular, although there is, to my delight, a green tea – strong. We also indulge in a mango cup and a milk chocolate cup – 10 mini pieces of chocolate in a take-away cup, for $5.00 CDN. Taka is helpful and eager to share his knowledge. He says he and Kayoko hope to “connect people through chocolate”. Their business cards reflect this, as he shows me the cocoa pod on the front is made up of little human figures, merrily crammed together, with their arms held high, as though basking in the chocolate. This little shop is set in a market, rather than a serene old tea house, and while I am sure no-one would ever feel like laying their weary head down for a nap, we have had a nice visit with a very friendly chocolatier . On the way home, my elder son, who is a “discriminating eater” (having been one myself, I prefer this to “picky”) samples from the milk chocolate cup. I hear “Mmmmmm” noises and he spontaneously declares the milk chocolate to be “soooooo goooood”. We pop the rest of the chocolates in the refrigerator to chill, and the next day, taste test the All Star box. A “road map” is included in the box, which is a very good thing, because each of the 3 trays are made up of chocolates with very different flavour characteristics. I really hope more Vancouverites discover La Chocolaterie. They are certainly building a loyal following on Urban Spoon, and Yelp, whose reviewers use such adjectives as “buttery, yummy, fresh, divine”. 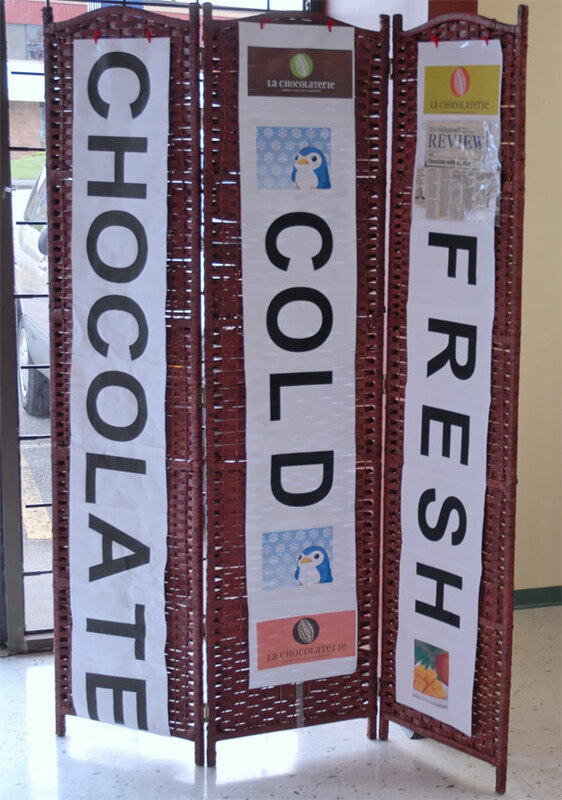 Made in small quantities, on a daily basis, these fresh chocolates beg to be consumed right away. I think this calls for another road trip. P.S. 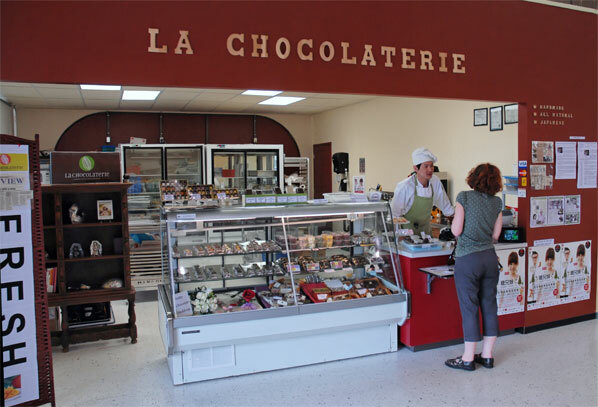 If you’re in the Vancouver area, you can find La Chocolaterie with the Find Chocolate app for Android and iPhone.